Bid protest is a protest made by an aggrieved party against the bid results in a situation where the contract goes to a third party who is viewed as non-deserving. The protest can be made in a formal or an informal procedure according to the law. In a formal protest the aggrieved party must prove that the decision was biased or prejudiced by improper agency activities. The aggrieved party can claim remedy for improper bidding if proved under the law. If the party is dissatisfied with the results of judgment then he/she can appeal to a higher jurisdiction according to law, which means the dispute can be appealed to the level of Supreme Court. The time available for filing a bid protest is also very limited after the bid award is declared. Therefore, filing against improprieties must be done quickly with the help of expert legal advisors. There are various forums to protest hearings such as Agency Level Protests, GAO Protests, Protests under the Court of Federal Claims, Protest under US district Courts and Courts of Appeals under Federal Circuit. The attorneys fighting your cases in these forums must be aware of all bidding policies and procedures under government contract law. Cases relating to collection and recovery of collateral, contract and lease enforcement; petitions to quiet title and eviction are categorized under bid protests. 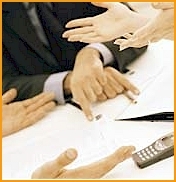 Dispute Resolution is necessary during vendor purchaser disputes, contractor disputes like breach of contract and development disputes to name a few. Issues like those between the landlord and tenant such as major rent reviews, dilapidation and lease renewals of commercial places come under the purview of dispute resolution act. The attorneys dealing with these case must be well accustomed with the fast pace of legal proceedings in the federal courts. They must have an expert understanding of all laws of the state relating to the case.